Are you searching for the best portable solar panels for camping? When it comes to camping, you need to consider buying lightweight solar panels. These devices don’t take up much space, which means that you can carry other belongings. Keep in mind that some models are foldable, which means they can fit in your backpack. You can use lightweight solar panels for charging entertainment, lighting, cooling and communications equipment while in the outdoors. It means they offer you several benefits. One brand you must consider buying is the Renogy 100 Watts 12 Volts portable solar panel. It provides you with the best convenience since you can carry it in your boat or car. 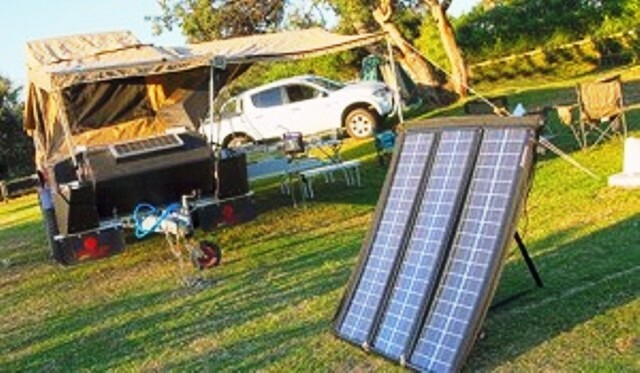 Its portability and robust is what makes it a suitable solar panel for camping trailer any day. It enables you to recharge your phone, radio, laptop or camera, giving you total peace of mind while you are out camping. You can also use it to recharge your camping trailer’s batteries. This review looks at the features and benefits of the Renogy 100 Watts 12 Volts solar panel, their pros and cons and finally delivers its verdict. Compact Design: One reason that makes the Renogy 100 Watts 12 Volts to be among the best portable solar panels for camping is it comes in a compact design, which makes it versatile and portable. When it’s folded, it measures 19.9 x 27.2 x 2.8 inches, meaning you have an easier time moving with it around while in the outdoors. You have other possessions to carry such as food and drinks, which mean you, want a solar panel which is lightweight for comfortable movement. 500 Watt Hours per Day: Depending on the availability of sunshine, the Renogy can provide you with up to 500watt hours in a single day. The result is you will enjoy extended entertainment, charging, cooling and lighting hours. When you compare this device with other modes, what you get is the best value for your money. Adjustable Aluminum Stand: This portable solar panel for camping comes with an adjustable stand which is corrosion resistant. It means you can use your device in the outdoors without worrying about corrosion. The protective casing gives you additional peace of mind that your investment is safe. It also has a heavy-duty handle and latches that ensure it’s safe for use while you’re out camping. Solar Cells Made In Germany: Even in a weak light environment, your power needs will be taken care of. That’s because Renogy 100 Watts 12 Volts has solar cells made in Germany. They will provide you with improved energy yields, in the long run, meaning you will get the best service. Safe for Use Outdoors: You want a device that is safe for use. It’s one reason which should make you consider the Renogy brand. For instance, its low voltage system prevents electric shock incidences. Remember that in most situations, you will be camping with family members, friends or colleagues.. The best choice for you should be to consider manufacturers who put your safety needs first. Solar Charge Controller: The Renogy 100 Watts portable solar panel comes with a 30A Built-In 4-Stage charge controller, which provides your investment with overcharge protection and reduces fire risks. It means that your entertainment and cooling equipment will be safe from damage. Two 50w Solar Panels: The Renogy 100W Solar Suitcase comes with two 50W Monocrystalline Solar Panel, a single protective suitcase for safe and secure portability and 15in sets of wires along with MC4 connectors. These components ensure you have an easier time when assembling your solar panel, meaning you will get the best service. It’s compact and lightweight. 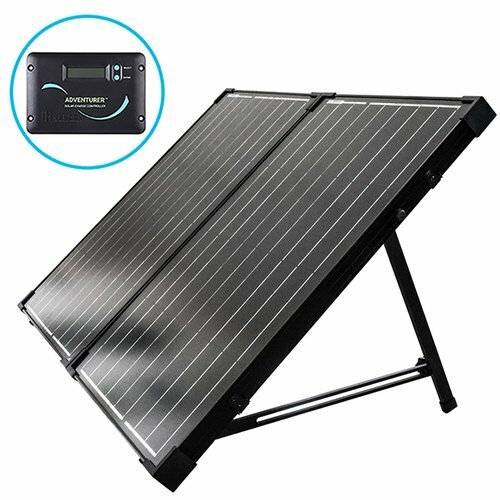 If you were thinking of going out for camping, you should consider buying this solar panel since it makes it easier for you to move around. The best portable solar panels for camping should be able to perform even under low light conditions. Some days may not have adequate sunshine to power your device, but you still need lighting and charging sources. Its Germany-made cells ensure you device serves you well even with minimum sunshine. The corrosion-resistant aluminum stand ensures that you can place your solar panel in any terrain. Its protective casing protects the solar panel from extreme weather conditions as you camp. You can store this product in your boat, car or home for emergency power needs. It offers a reliable power source as along as there is sunshine. The Renogy brand offers you value for your money. It comes with an inbuilt adjustable stand that’s corrosion resistant, latches to enable it last longer and a protective casing. If you love going out camping, you should ensure you select this device when comparing the best models to buy. While out camping, you want a device that will minimize incidences of electric shock dangers. It comes with an inbuilt charge controller which reduces fire and overcharging risks. For some brands, you will need to purchase the charge controllers separately, making this unit worth your money. The Renogy brand promises you portability and solar power if you choose to buy this brand. It’s the perfect off-grid buy since it provides you dependability and convenience. For instance, recharging your laptop, camera, phone or radio will be a smooth and comfortable experience using the Renogy 100 Watts solar panel. If you were searching for the best portable solar panels for camping, one of the models you should consider purchasing is the Renogy 100 Watts 12 Volts compact solar panel. As the above review shows, it comes with several amazing features that will ensure your device serves you well. In previous years, camping without a power source was common. However, recent developments in technology have made camping with power easier to achieve, thanks to portable solar panels. For some people, camping with a source of electricity doesn’t offer them the thrill that comes with being in the outdoors. However, it’s important that you realize having a direct source of power makes your experience in the outdoors memorable. Remember that when it comes to camping, your aim is to have a good time by relaxing, which means it makes sense for you to bring some modern devices along with your journey, for example, if you’ll be camping in a vehicle/caravan. There aren’t many ways to camp without electricity, that’s apart from campsites with power grids, which can be costly. Using the best portable solar panels for camping, many campers are now choosing to set up their power grid. They are easy to set up and affordable, the result is they are becoming a must-have for campers around the world. In this informative guide, we’ll look at everything you need to know about camping using lightweight solar panels. For many people thinking of setting a small power grid using portable solar panels, the idea may sound complex. However, it couldn’t be easier. For example, you may think you need lots of equipment. In reality, you only need four devices. The cost of each of the above four devices may vary. What you should realize is that a complete setup may cost just a few hundred dollars. In the case you opt for powerful solar panels, the cost may rise slightly. The first thing you need to do is to determine what type of solar panels you need. For some people, the best idea is to invest in several solar panels, while others will want just a single solar panel. The best thing is that the market has several shapes and sizes of solar panels to choose from. For example, you can find flexi-panels, foldable and standard rigid panels, which most people have seen. When choosing the best style, it’s important you take into consideration how you will be traveling. For example, foldable ones are the best option if you’ll be camping in a tent since you can fold them fast. On the other hand, rigid types are the best option if you will be using a camper van or vehicle since you can attach them. Weather conditions will determine how much solar energy you will harvest from your solar panels. For example, a nice day with sunlight in the US summer can see a 100W solar panel give you as much as a battery life of 50 hours. However, during winter, this will reduce drastically. For summer campers, this may not be an issue. However, if you prefer camping any time of the year, your best choice should be panels or solar panels with higher wattage. Keep in mind solar panels come in varying wattage, which means you need to choose the right option for your needs. Among the smallest sizes available in the market are 5W or 10W. If you use your battery sparingly, they are enough to power it. However, for campers, this power may be too little since the battery will be used frequently. For example, while camping, you may want to play your radio, charge your Smartphone and have some lighting. That means your best option should be to purchase solar panels in the 50W to 80W range. They should provide you with enough power to recharge your battery since it will be used to power several devices during the day. If you have a camper or larger vehicle that’s powering lots of devices and appliances, your best option should be the Best Portable Solar Panels for Camping that offer 100W. If you will be coming with caravans with things such as lighting rigs, fridges and caravans, the best choice for you should be 150W to 200W solar panels. After you settle on your ideal solar panel, you should now think about the battery. It’s important that you make the best choice since you will need a deep cycle battery with the ability to store all the energy you gather from your portable solar panels. One excellent piece of advice is to choose solar panels first before you settle on a suitable battery type. It’s advisable that you chose a battery that comes with enough capacity to store and then distribute the power, meaning you should check on its Ah capacity when shopping online and consider how much daily wattage you will use. If you expect to use more power, then you should choose a higher Ah capacity. The market has many different types of batteries, which means you should research well to arrive at the best option. for example, AGM batteries are less costly when you compare them to gel batteries. However, if you will be using devices that consume a high amount of power, AGM should be your best choice. The final part of your off-grid solar panel set is the crucial charge controller, which provides the link between the battery and the solar panel. It works by transferring the voltage from the portable solar panel and reduces it before storing it in the battery. This function ensures that your battery holds an excess charge without doing any damage. It also helps to avoid power draining when there’s no sunlight to generate additional power. In simple terms, a charge controller lets your battery perform to its maximum efficiency and assists it to last longer. Solar charge controllers come in two primary configurations, the Pulse Width Modification (PWM) and the Maximum Power Point Tracking (MPPT). MPPT is your best choice in terms of performance. However, that makes it quite expensive. It provides you with efficiency levels of up to 90%, which means they are ideal for large systems since can offer you more 20% more power. That’s by altering the input voltages. PWM features in most setups and is a three-stage controller. Its budget friendly and is perfect for smaller systems. It’s suitable for several camping setups, even if you’ll be using a caravan. A portable solar panel offers a reliable power source and backup when you are on the move. Remember you only need four things, that’s the solar panels, leads, a charge controller and a battery. Read online reviews when searching for the best brands to assist you to get the best solar panel for camping and value for your money.